IPSC is the International Practical Shooting Confederation, it’s an orginization with the goal of promoting and advancing practical marksmanship for rifle, handguns and shotguns. In most parts of the world, practical or dynamic shooting competitions are either part of the global IPSC orginization or follow most of their rules. Practical shooting competitions emerged in Southern California in the 50’s and spread throughout the world. In 1976 the IPSC was formed and a more stringent set of rules and guidelines was adopted. In order to reflect skills needed for both defensive and offensive use of firearms, for example for law enforcement and military, there are three guiding principles: accuracy, power and speed. When competing your score is a hit factor which is points divided by the time in seconds. That’s where the accuracy and speed comes into play. To be eligible to compete your firearm needs to have a certain power factor (bullet weight times muzzle velocity) and you can also score better for non A-zone hits if you shoot more powerful rounds that make Major power factor. That’s power in the guiding principles. 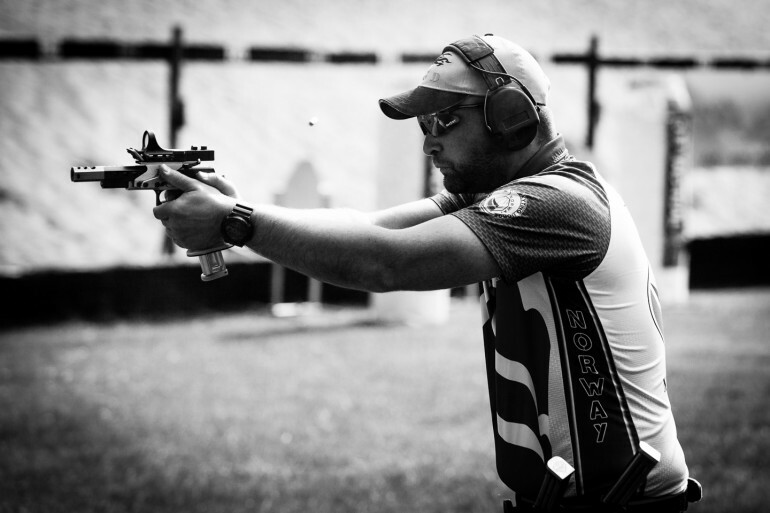 IPSC is fun, safe and has evolved into a true sport far from its roots. It’s exciting and suitable for young, old, men, women and all skill levels. Due to the way matches are ran you can compete in the same match and even the same squad as the world champion in your first match. But the dynamic nature of the sport and variety of stages encountered means that you’ll have to have your shooting skills perfectly dialled in, be agile and light on your feet and execute you stage strategy to perfection to match the top shooters. The type and size of matches are described as Level, a Level I match is a internal club competition, a Level II an open match and Level III a national level match, usually with a national championship in one of the divisions. Level IV and V are regional and international championships. Each match consists of a number of stages. The bigger the match the more number of stages; a Level I and II often consists of 5-8 stages and a Level III 12-14. The stages are categorized as small, medium, and long depending on the minumum number of rounds needed to score all targets (which are 12, 24 and 32, respectively). There’s a defined ratio for stage lengthes for a match at 3 short : 2 medium : 1 long. A 12 stage Level II match needs to have 6 short, 4 medium and 2 long courses, for example. Competitors are orginized into squads usually consisting of 5-12 persons who take the stage briefings together and then perform one after another. The first person to shoot the stage is rotated to even out any unfair advantages of seeing other perform. Courses of fire consists of a number of paper targets and possibly steel plates, poppers. Rifle matches can also use frangible targets like clay pigeons which counts as steel. An IPSC paper target is a brown piece of cardboard with some faint lines only visible close up. It has three scoring zones; the A-zone, C-zone and D-zone. Don’t ask where the B-zone went. Unless otherwise specified an IPSC paper target should be hit two times, it’s common to describe this scenario as “9 paper targets, number of rounds to be scored: 9”. The A-zone gives 5 points, the C-zone 3 points in Minor power factor (4 points in Major) and the D-zone 1 point in Minor (2 points in Major). Steel, both plates and poppers, gives 10 points and they must fall to be counted, so while only one shoot should be enough it can depend on the hit and distance. Missing a target or shooting a no-shoot (white target usually covering part of a paper target) deducts 10 points. Failure to engaging a target also leads to losing 10 points in addition to the misses and not getting any points for the hit. As you can see, missing a shot quickly leads to losing many points and will significantly lower your score for the stage. 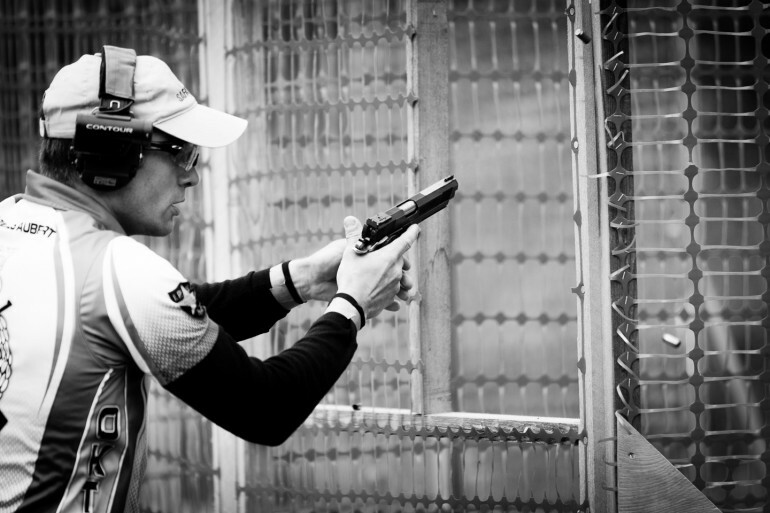 In IPSC you compete in Divisions depending on your gear. In Handgun there are five divisions: Open, Standard, Production, Classic and Revolver. Production has a fixed list of allowed guns where only small alterations to the sights and grips are allowed, pistols in this division are always scored Minor and the magazines can only be loaded with a maximum of 15 rounds. They must still have a caliber of at least 9 mm and make 125 in power factor like all other divisions (bullet weight in grains * muzzle velocity in fps / 1000). This division is made for typical service pistols and is the most popular and economical, but quite possibly the one with the closest margins and the toughest competition due to the level playing field. 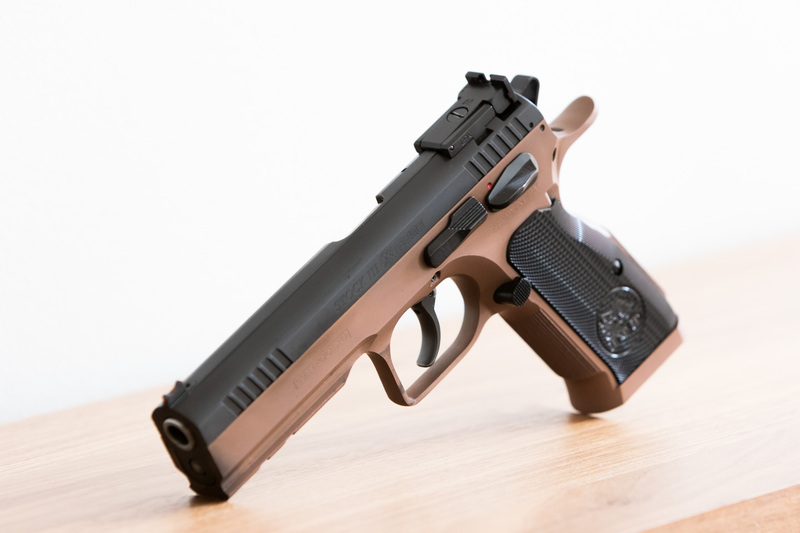 The most popular gun is the CZ-75B SP-01 Shadow and similar pistols from for example Tanfoglio although Glocks and other striker-fired pistols can be competitive in the right hands. A state-of-the-art production pistol, the Tanfoglio Stock III Xtreme. Classic division is restricted to single stack 1911-style pistols. The magazines can be loaded to 8 rounds in Major (min. .40 caliber and 170 in power factor) and 10 rounds in Minor. In Europe this is a fringe division with only a few competitors. A similar, less popular division for enthusiasts of a particular type of firearm is Revolver, restricted to double action revolvers where a maximum of 6 shots can be fired before reloading this leads to a sub-optimal flow since most stages are designed for higher capacity handguns. Revolver can also be scored in Major, a power factor of 170 is needed and there’s no minimum caliber other than the 9mm minimum for all divisions. Standard is where things start to heat up a little and we see more custom built race guns. In Standard the gun, including magazine, has to fit inside a box of 225 mm x 150 mm x 45 mm and it can’t be equipped with a compensator or optic sight. Other than that it’s free to build or modify as long as it’s safe. The limit for Major power factor is 170 with a minimum of .40 caliber. In order to be competitive in this division you have to shoot Major and fit a lot of bullets in your magazines, typically 18-20 or more. In this division double stack 1911’s like STI or SVI Infinity pistols reign but you can also see Tanfoglio Limited Customs and CZ Tactical Sports. It’s also quite common to see competitors with Production pistols who want to fill up the magazines to their full potential and maybe enhance the trigger a bit. But make no mistake, the best pistols for this division are full race guns and you’ll get a competitive disadvantage if you don’t meet up with the same level of equipment. 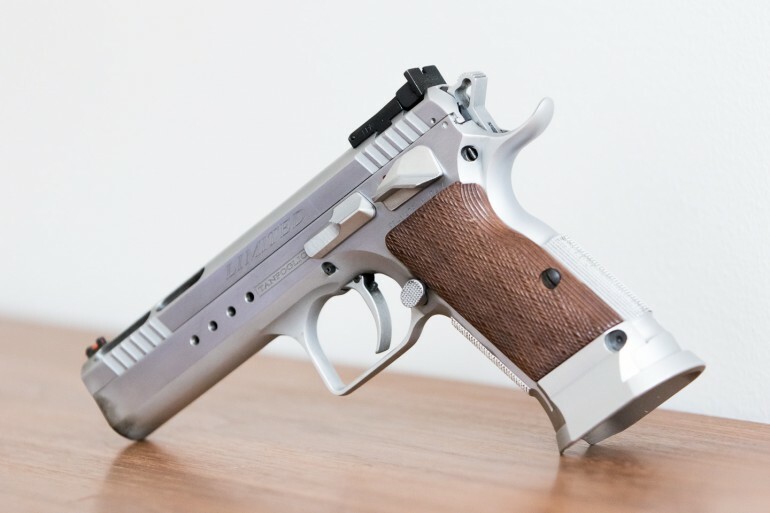 A Standard Division pistol, the Tanfoglio Limited Custom HC. Note the mag well and lightened slide, this handgun also has a single action only trigger mechanism. The grand daddy of all divisions is Open division. As long as your handgun is safe and only fires a single shot per pull of the trigger it can look and function as you’d like. Magazines are restricted to 170 mm in length and the minimum power factor for Major is 160 using 120 grain 9 mm bullets, resulting in 27-28 rounds in full size magazines. Unlike the other divisions you can also carry your gear how you’d like on your belt, in the other divisions you’re restricted to placing the holster and magazine carriers behind your hip bones. A compensator with ammunition tuned for it results in little recoil, but a very loud bang, and the red dot used in most sights is easy to pick up even for those with less then perfect sight. With the sights and accuracy of the guns it’s also often possible to compensate for not moving as fast, you can often trade movement with more difficult shots on stages. This means that this division is not only for those who go for the outright overall win. A 2011-style Open gun with a red dot sight, compensator and full size magazine in action.